Tired of your exotic Supra riding like a worn out Pinto? Is your Supra about a decade old with 100,000 or even 200,000 miles on it? Does your dream car ride like its worn out no matter what you’ve done to try to stop it? R2 Racing brings us a the first and only bushing replacement kit! We have installed this kit on a 1994 Supra with 166,000+ miles. This Supra had HKS HiperMax coilovers, TRD B.A. Sway Bars, new tires, and has been well maintained. However, it still had that old and worn feeling on the chassis. After replacing the Toyota bushings with this R2 kit the results are amazing! This same Supra now feels like it has 20,000 miles on it and is a year old all over again! We can’t recommend this kit enough to virtually every MKIV Supra owner! This kit replaces upper arm, lower arm, and strut rod bushings (4 upper, 4 lower, 4 strut rod). 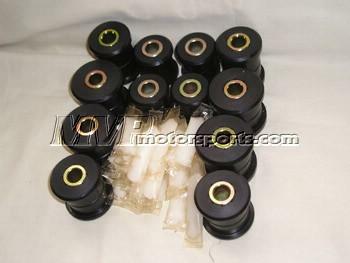 All replacements are 2 piece – 12 bushings replaced, 24 pieces total. All R2 kits come with grease and instructions but require a fair amount of mechanical ability and familiarity with the specifics of urethane bushing installations. This is not an amateur installation. However, it can be made a lot easier by taking out the control arms yourself. Then take the control arms and this kit to a machine shop that has a press. They can then take out your old bushings and install the new ones.